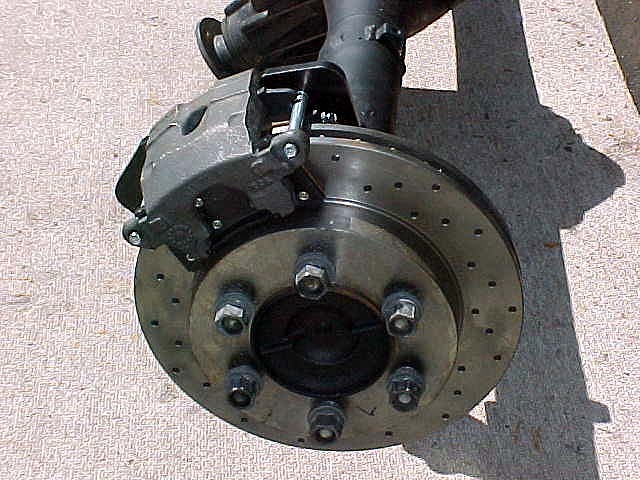 Toyota pickups and 4Runners have always come with rear drum brakes from the factory. Although my '86 pickup came with larger rear drum brakes than the '85 and earlier trucks, I still felt they would be insufficient when combined with large tires and heavy steel wheels. Brakes are an often overlooked, but vitally important, component of our trucks. 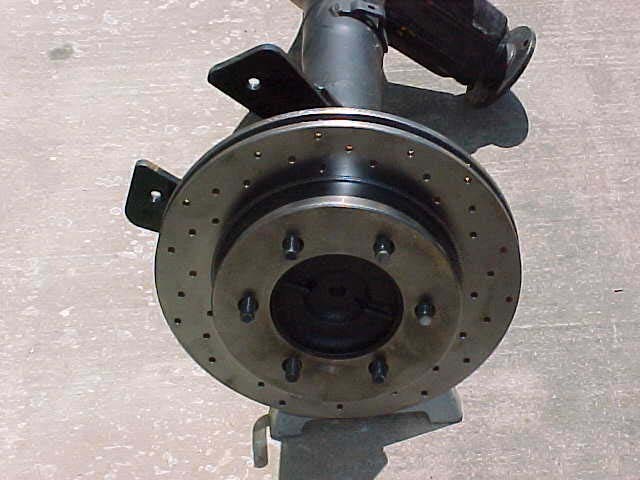 Drum brakes are also more difficult to service and are more susceptible to contamination in harsh off-road environments. 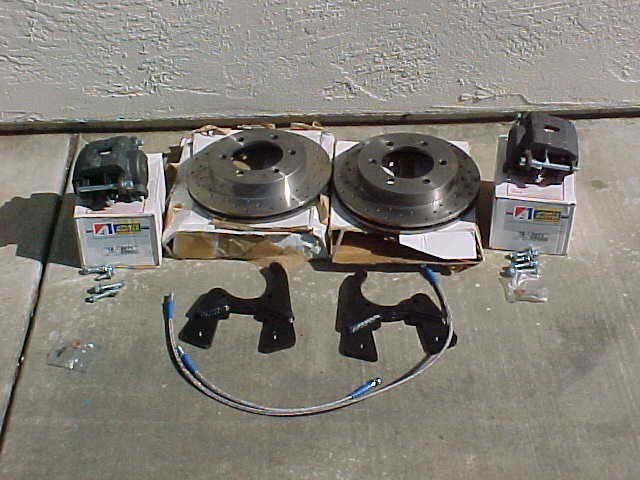 A few years ago there were no kits available to convert the rear brakes on Toyota mini-trucks and 4Runners from drums to discs. The popularity of these vehicles on the trails lately has changed all of that though, and now there are several options to choose from including Downey, TSM, and Front Range Off-Road. Yet another option is from a company partly responsible for the recent popularity of Toyota minis; All-Pro Off-Road. 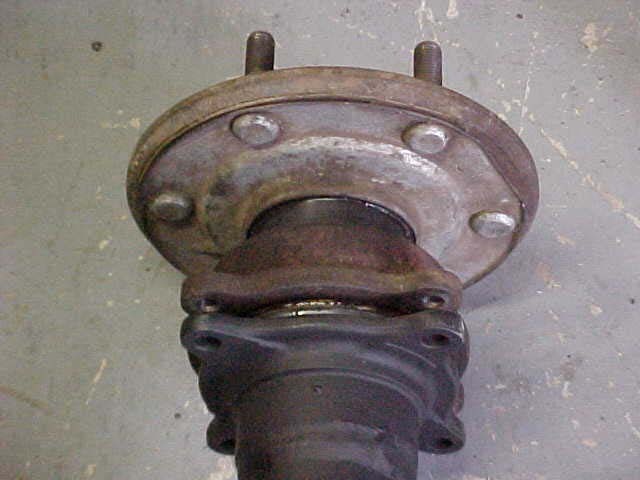 The axle housing and shaft stripped of the drum brakes. My rear disc brake conversion kit arrived from All-Pro quickly and was well packaged. The kit includes two refurbished single piston GM "Metric" calipers (complete with pads), huge cross-drilled, vented rotors, mounting brackets, braided steel brake lines to replace hard lines to the calipers, and all required hardware. Not included is an extended brake line from the proportioning valve to the axle. If you already have this piece prior to installing the rear disc brakes, it can be reused. Also missing are instructions, which would have made for a faster installation, as this was the first time I had converted drum brakes to disc brakes. Even without directions, the installation was fairly straightforward. The caliper bracket mounted on to the housing. All of the parts are left and right-hand specific, so the first order of business is to sort out all of the components. The rotors were labeled right and left (the holes should be sweeping back as the wheel turns forward) but the calipers and brackets were not. You will want to mount the calipers so that the bleeder valve is at the top so you can easily bleed out all of the air. As for the brackets, they will need to be positioned so the piece that mounts to the caliper is to the outside. 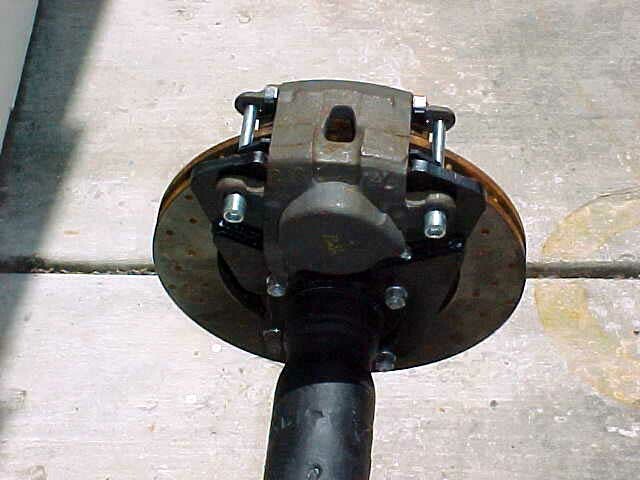 The disc positioned on the axle shaft. Minimum tools required for the swap include a 21mm or 13/16" lug wrench, tin snips, a 14mm socket and ratchet, a 14mm wrench, and a 10mm or 3/8" allen wrench. Now that everything is laid out before you, the installation can begin. You will need to start by removing the drums and axle shafts from the housing. The drums can be discarded and the backing plates and three of the four studs must be removed from the bearing retainer. I found it easier to press off the bearing and then cut off the backing plate, but this could be done while the bearing is still on the axle shaft if you do not have access to a press. Looking at the mounted caliper from the front. Now it is time to start reassembling the brakes with the new parts. 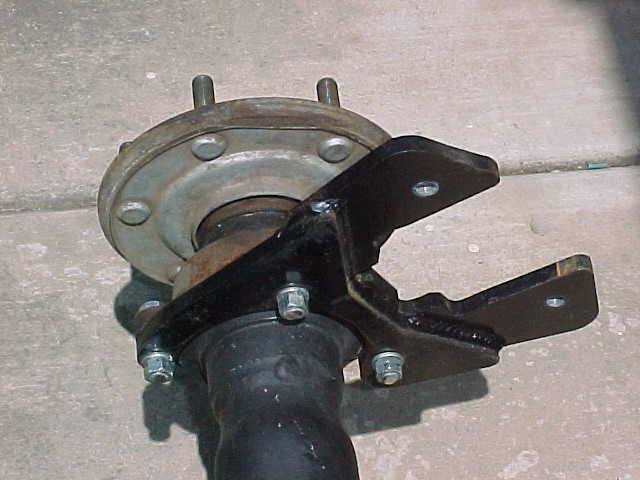 Begin by reinstalling the axle shaft with the caliper bracket positioned behind the axle housing flange. I mounted the bracket so it positions the caliper towards the rear of the axle to ease brake bleeding, but you could mount the caliper at the top of the axle for more ground clearance. The bottom, front hole retains the original stud, while the other holes use the included hardware to hold the bracket in place. I found the included 3/8" bolts to be overly long at 2 inches, but 1 " were too short and my local hardware store did not have 3/8" x 1 ", so I removed the excess with a cutoff wheel. This is not a necessary step, but it results in a cleaner finished product. 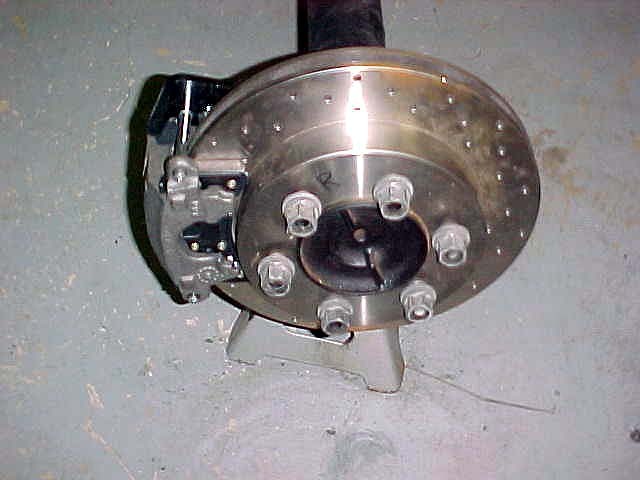 The mounted caliper from the back side with the axle flipped (bleeder down). With the caliper mount attached you can now add the disc to the back of the shaft. The fit is very tight around the hub center hole and I had to torque down the lug nuts over the disc in order to properly seat it. As the lug nuts are the only thing locating the disc, it is crucial that the fit around the hub is snug. Positioning the disc was made easier with the help of an impact gun. Next I attached the caliper to the mount. It took a slight bit of "persuasion" to get the holes in the mount to line up with the caliper slide pins, but I was able to mount the calipers without having to grind or modify any parts. The last step was plumbing the steel braided brake lines to the "T" fitting on the housing. I would prefer hard lines to steel braided lines and in the future plan to modify the stock hard lines for use with short steel braided lines at the ends, but for now I am confident that the included lines will work fine. It should be noted that the All-Pro disc brake kit has no provision for an emergency brake. This was not a concern for me as I am using All-Pro's transfer case mounted emergency brake. If not using this unit I suggest either purchasing a kit from another manufacturer (some of which have emergency brake provisions) or using a line lock device such as available from Hurst. You will also need to address your master cylinder after swapping to rear disc brakes, regardless of the kit you use. Options include adding a proportioning valve such as available from Wilwood or changing the master cylinder to another unit, such as from an FJ-80 Land Cruiser, which came from the factory with four wheel disc brakes. Overall the quality of the parts included in the All-Pro kit is top notch. This was confirmed by how easily all of the components mated together. Unfortunately at this time the truck the kit is being used on is still in the "project" phase, but I hope to report back soon with impressions from the kit. I look forward to decreased stopping distances and no more heavy drums getting filled with mud.